Whisky Johnnie Walker Blue Label 40 % 70 cl. 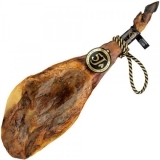 "5 Jotas" Acorn-Fed Pure Iberian Ham has an incomparable taste and bouquet with a lingering aroma. When sliced, one can appreciate its uniform colour with myriad shiny streaks of infiltrated fat. In Spanish, the word ‘Cecina’ basically means "meat that has been salted and dried by means of air, sun or smoke". Vecchia Romagna Etichetta Nera 38 % 70 cl. Brandy National 18,70 EUR / 26,71 €/lt. Champagne Moet & Chandon Reserve Imperiale Boll. Blu - Moet & Chandon 48,65 EUR / 64,87 €/lt. Blue Gin Vintage 43 % 70 cl. 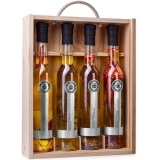 - Distillery Reisetbauer 41,80 EUR / 59,71 €/lt. Blanquette de Limoux Reserve Brut Millesimé - 2014 - Antech Limoux 20,60 EUR / 27,47 €/lt. Riesling Morstein secco 2014 - Winery Wittmann - Rheinhessen 83,35 EUR / 111,13 €/lt. Acorn-Fed Pure Iberian Ham Puro paleta de Bellota app. 4,7 kg. - 5 Jotas 210,00 EUR / 4,47 €/100 gr. Whisky Johnnie Walker Blue Label 40 % 70 cl. 211,70 EUR / 302,43 €/lt. Porto Colheita Tawny Port - 2000 - Quinta do Noval 83,95 EUR / 111,93 €/lt. I liked it, it is very tasty. Thanks, Heinrich Summerer ..